Stephen Davison is the founder, President and visionary marketer behind Clean Control Corporation which is located in Warner Robins. Clean Control manufactures ‘OdoBan® The Original Odor Eliminator since 1980’, as well as multiple high-quality products sold under the brands OdoBan®, Earth Choice®, Lethal®, Pets Rule® and Sports Edge®. Clean Control is a locally-owned business, employing in excess of 100 employees. The company’s various products are sold worldwide and through independent retailers, national chains – including Sam’s Club, Walmart, The Home Depot, Ace Hardware, True Value as well as online outlets such as Amazon.com, HDSupplySolutions.com, Grainger.com and other fine retailers. At the age of twenty-four, Davison started Mobile Wash of America (MWA), a successful government janitorial contractor with a focus on cleaning industrial equipment. Escalating chemical costs and the need for superior products led Davison on a mission to develop technologically advanced, cost-effective cleaning solutions. The first batch of OdoBan® was mixed in Steve’s bathtub in 1980 right here on American Boulevard. Being a ‘bathtub chemist’, Steve recruited the help of a friend and actual chemist, Cory Hammock, to develop OdoBan®. Their original focus was to develop a highly effective product that was concentrated and cost efficient, yet would meet the challenges in nursing homes. In 1980, there were few commercial products available that could get rid of odors from bed pans, soiled bed linen and night gowns. Colostomy bag odors and the ‘Cancer smell’ associated with patient rooms were an entire category all unto themselves. Extensive research on these specific human biological odors would eventually lead to the Lethal product line. The OdoBan ‘Tub Trials’ led to many products after initially being tested on baby diapers; The Ultimate Test! Sam’s Club offered to carry OdoBan® as a trial in their Macon Georgia club starting in 1991. Realizing the potential of OdoBan and knowing you can’t serve two masters, Davison sold his janitorial company and established Clean Control. 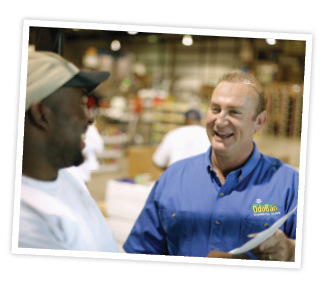 By 1995, the OdoBan product was carried Nationwide in Sam’s Club, which enabled Clean Control to expand with additional products and line extensions. Clean Control has been able to expand and grow to the company it is today because of the willingness of Sam’s/Walmart to take a chance on a small, local manufacturer back in 1991. Only in America! Starting as a small business, the basic philosophy has always been to go one step further. “We didn’t just make a deodorizer, we developed an odor eliminator and disinfectant that cleans. We didn’t just make something to mop up grease, we developed bacterial solutions that would eliminate grease, which was the basis for our bacterial line,” says Davison. The OdoBan® brand of products is recognized worldwide as a leading solution for odor elimination and disinfecting. Thus, Clean Control’s customer base has grown to serve various market segments which, today, includes household consumers as well as wholesale, industrial, commercial, and institutional customers around the globe. This market diversity is a tremendous testament to the quality and effectiveness of Clean Control’s product lines. Davison attributes the company’s ongoing growth to his Christian beliefs as well as his passion to provide innovative products for the industry. Clean Control’s capabilities include manufacturing, sales, shipping, distribution/logistics, marketing, promotional packaging, graphics, POS and display services for all product lines. In 2013, Clean Control added a 150 kW grid-tied, ground-mounted solar array that produces approximately 80% of its energy usage. Back to Back! 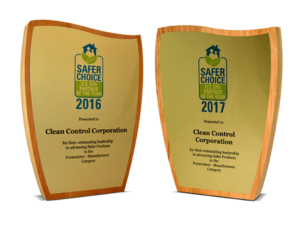 In May of 2017, Clean Control Corporation was recognized as Partner of the Year in the U.S. EPA Safer Choice Program for advancing the goal of chemical safety and continually driving innovation; FOR THE SECOND YEAR IN A ROW! The U.S. EPA Safer Choice label helps consumers easily find products that are safer for people and the environment.